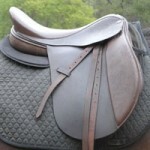 Good saddle fit is imperative for ridden horses. Horses need to be comfortable and their back needs to be unrestricted so that they can use their backs and bodies in a healthy biomechanical way. You might liken saddle fit to how your shoes fit. Shoes that are too tight, too big and move or rub are going to be very uncomfortable and could even be painful. Some shoes will help you to be athletic and others will be quite restrictive. I have seen badly fitting saddles be the cause of many behavioural and training problems in horses which had previously been put down to bad manners, disrespect, bad attitudes or just their nature to be impulsive or lazy. I have seen people spend hours and hours riding, spend hundreds and even thousands of dollars on lessons with horses going through hell in the process, as people tried to train them to use their bodies well, be engaged and be athletic when the biggest problem was an ill-fitting saddle. Once the saddle problem was rectified the horse could simply and easily do and often would “offer” what the rider was asking. Once I saw this I knew how important saddle fit really was and I also realised how much misinformation there was about saddle fit because many of the people in those situations had purchased expensive saddles and had been given professional advice about saddle fit. Sometimes improving a saddle’s fit and comfort for the horse and rider is as simple as making some adjustments with padding arrangements or adjusting the gullet if that is a possibility, it does not always mean purchasing a new saddle. How do we know if a saddle fits well? A good saddle fit allows horses to move with healthy biomechanics. So to ascertain whether a saddle does fit requires good knowledge of equine biomechanics. Ultimately it is about allowing the horse to be the judge by offering the horse options in saddles and padding arrangements and observing their response. This is where the knowledge of biomechanics comes in because we need to know what we are looking for in terms of balance, straightness, impulsion and how the horse uses their body. The horse’s mental and emotional state and the expression on their face will also give feedback. There is a lot of misguided information about saddle fitting mainly because most people do not understand healthy biomechanics for the horse and also because many people have not taken into account that a saddle that is made to fit a horse’s static shape (standing still) will not fit the horse’s moving shape. In giving the horses options to gain feedback, we must make sure that we are offering good options for comparison. There are certain design features that we have discovered horses like and also certain things to look for in positioning and balancing the saddle which are going to be important to know for this process. In the Equine Biomechanics and Saddle Fitting lecture /demonstrations that I present people can quickly and easily learn what to look for. 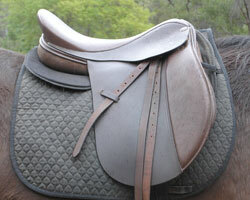 I am a Test Ride Facilitator for the BALANCE saddles. I carry a range of the saddles and can assist you to try the saddles to see if they suit you and your horse and if so can help you choose which BALANCE saddle is the ideal one for both you and your horse. You may already suspect that your current saddle is not supporting your horse’s needs and are looking to find ways to improve it or find an alternative saddle, or you may just want to reassure yourself that your current saddle is the best option, by offering your horse a comparison. The aim of these sessions is not to necessarily sell you a BALANCE saddle but to improve the horse’s comfort in whatever way we can. These saddle fitting session take 1.5 – 2 hrs. To begin you ride in your current saddle and then we look at what we may be able to do padding wise or by changing gullets (if possible) to improve your existing saddle. I then would have you ride in one of the BALANCE saddles to observe the quality of movement your horse offered which can then be used as a comparison to gain information about how your current saddle is affecting your horse. If your horse did go better in the BALANCE saddle and you were interested in possibly purchasing a BALANCE saddle you would then try several other BALANCE saddles to find which one best suited both you and your horse.